Walt Disney Feature Animation had decided in the late 1980s, at the dawn of the Disney Renaissance, to release at least one animated Disney movie per year. Since quality animated Disney movies take, on average, about five years to put together, that required a bunch of different work groups all working simultaneously on different - but equally important - projects. 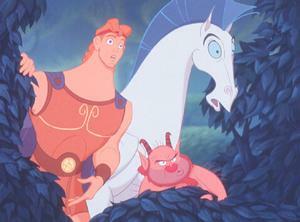 "Hercules" (1997) was being put together by one of the studio's top directing duos, Ron Clements and John Musker. Their previous three films, "The Great Mouse Detective," "The Little Mermaid," and "Aladdin," were phenomenally successful Disney movies. So, omens were good for a sure-fire project about the one Greek God that everyone knows - or, were they? Zeus and his wife Hera, rulers of all the gods on Mount Olympus, celebrate their defeat of the Titans by having a son they name Hercules. Zeus' brother Hades is not happy for Zeus because Hades intends to overthrow his brother Zeus and rule in his place. Hades consults the Fates and learns that a rare planetary alignment is coming that will enable him to achieve his goal. 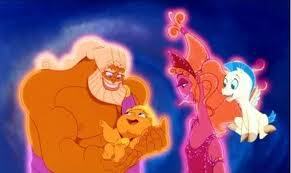 The only problem, the Fates tell Hades, is that Hercules might interfere and screw everything up. Hades decides not to take any chances and sends his assassins Pain and Panic to take care of the little guy. They kidnap Hercules and turn him into a mortal, but forget to remove his god-like strength before Hercules is found by farmers Amphitryon and Alcmene. 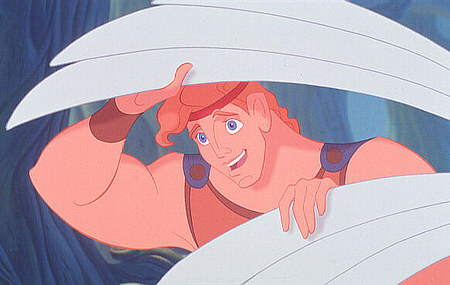 Hercules grows up strong, but nobody likes him because he is different and he wants to know why. His parents don't have any answers except a necklace Hercules was wearing when they found him, so he decides to see if the temple of Zeus has any answers. Indeed it does, for when Hercules enters, the giant statue of Zeus tells him that he can regain his status as a god by doing good deeds and becoming a hero. Zeus guides him with Pegasus to Philoctetes ("Phil"), a satyr who is known for developing heroes. 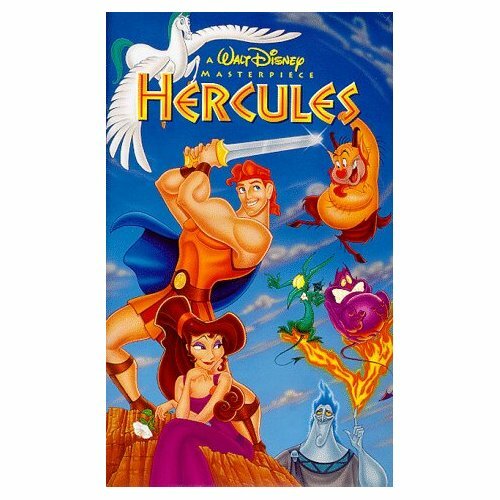 Phil wants nothing to do with Hercules at first, having tired of the "hero-training" business, but Hercules convinces him to give it one more go. After extensive training, Pegasus takes them to Thebes, and Hercules saves Megara ("Meg") from the centaur Nessus. Meg, though, turns out to be a follower of Hades. 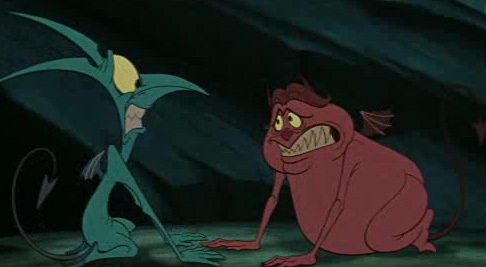 In Thebes, Meg finds Hercules again and tasks him with saving two "boys" trapped in a hole. 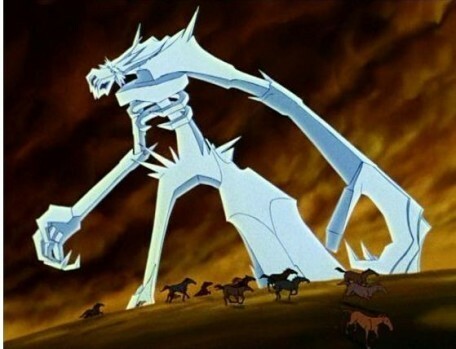 The two in fact are Pain and Panic, and they summon the Hydra to do battle with Hercules. After much fighting, Hercules defeats the Hydra, but Zeus tells Hercules that he has more to do before he can earn his god status back. Hades bargains with Hercules to give up his superhuman strength for 24 hours in exchange for Hades leaving Meg alone, and Hercules agrees, only to be stunned when Meg reveals her identity as Hades' minion. Hades uses the 24 hours to unleash the Titans, who climb Mount Olympus and imprison the gods. He also sends a Cyclops to Thebes to take care of Hercules. 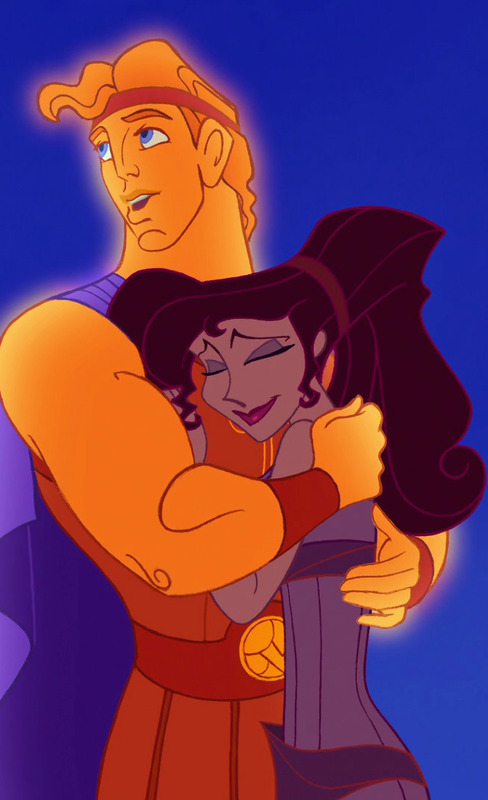 Meg, who has developed feelings for Hercules, is crushed by a falling pillar while trying to save Hercules, which gives him back his strength. After defeating the Cyclops, Hercules flies up to Mount Olympus on Pegasus and frees the other gods, throwing the Titans into space. Returning to Thebes, Hercules finds that Meg has died and her soul has become Hades'. 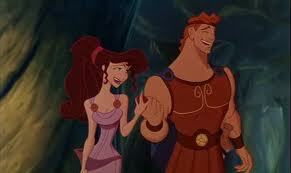 Hercules invades the Underworld realm of Hades and bargains his own life for that of Meg. 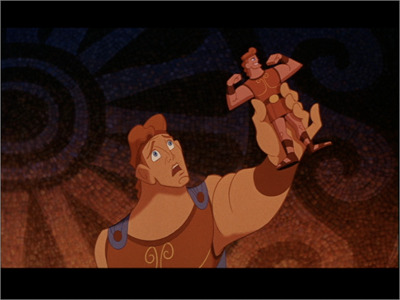 This self-sacrifice on Hercules' part restores his status as a god and makes Hercules immortal. Rescuing Meg, Hercules punches Hades into the River Styx. Zeus and Hera then invite Hercules to come and live with them, and Hercules must choose whether he wants to live with the gods on Mount Olympus, or on earth with Meg. "Hercules" veers very close to being a parody of the Greek myths. Innocent, naive-sounding Tate Donovan voices him as a classic rube who only wants to find himself. The rest of the cast largely plays it for laughs, as Danny DeVito hams it up as Phil, and James Woods plays Hades as a fast-talking con man. Susan Egan as Meg also goes for the laughs, and comedians Bobcat Goldthwait and Matt Frewer serve up Pain and Panic as humorous henchmen. Wayne Knight from "Seinfeld" has a small role as Demetrius, and a serious opening narration by Charlton Heston sets everything up to be quickly undercut by the hammy supporting players. Despite all the comedians, though, perhaps the funniest thing about the film isn't anything in it, but rather what happened when Disney released this film. Disney had the sheer effrontery to ask the Greek government if they could premiere the film at one of Greece's most sacred spots, the Pnyx Hill where Athenian democracy took root. The Greeks took one look at the film and turned them down flat, claiming that it was just "another case of foreigners distorting our history and culture just to suit their commercial interests." That had to be one of the sharpest and most cutting rebukes the mouse company has received in its nearly a century of operation. Ouch! Disney, though, couldn't alter the film to suit the Greeks, as they had an entire marketing campaign already in progress, including books, toys, and even a parade down Times Square. Not only that, there was a hit television series called "Hercules: The New Adventures" on the air, and Disney set up a "Disney on Ice" spectacle even before the film hit theaters. A licensed video game, "Hercules Action Game," also was ready to go. It was all such a sure thing, with so many good omens, that much of the promotional activity and merchandising was put in place before anyone had even seen the film. When "Hercules" was released in the summer of 1997, it didn't flop spectacularly, but it didn't do very well, either. "Hercules" underperformed at the box office, taking in less than $100 million domestically, even less than the previous year's underwhelming "The Hunchback of Notre Dame," and much, much less than that film worldwide. So what happened? Why did such a sure thing as "Hercules" have such problems? The animation is good, and some of the songs are quite memorable. 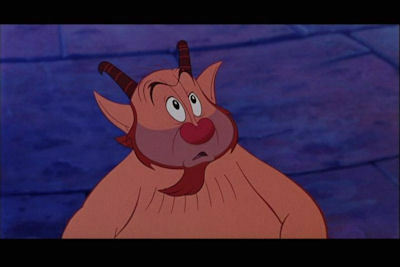 "Go the Distance" by Alan Menken and David Zippel was nominated for an Academy Award, and "Hercules" received several nominations from other awards shows. Woods is smooth as silk as Hades, and there are more pure comedians in the cast than in your average sitcom. Disney blamed "the competition," but it was more than that. The answer is, Disney got a little too full of itself. 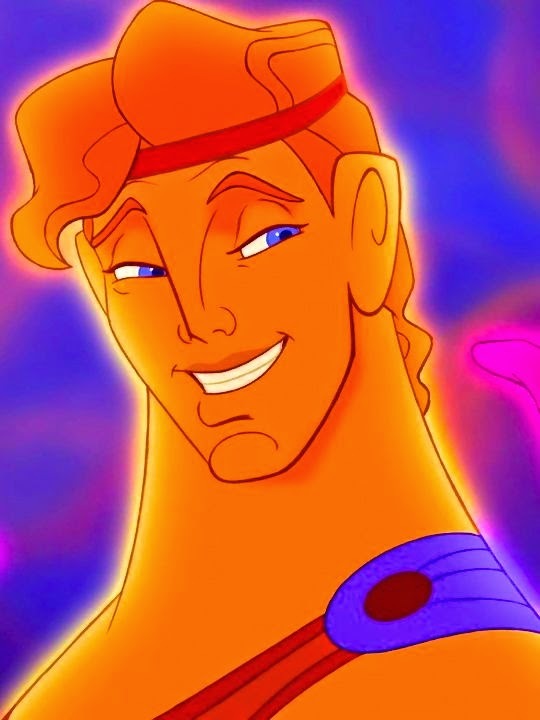 While Hercules may seem so accepted as a textbook Greek myth that he seems ripe for parody and comic interpretations, not everybody sees it that way, and certainly not the Greeks. To them, he is a real entity who deserves to be treated with respect, especially by non-Greeks. 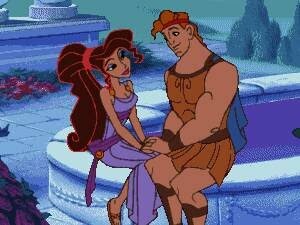 Making fun of Hercules, many of them no doubt feel, is akin to making fun of them. And nobody really likes a foreign company making fun of them as it also tries to make a buck off them. "Hercules" started off well but but then got ensnared in serious miscalculations. If they had stuck with the tone set by Charlton Heston's opening narration and done a straight-forward explanation of Hercules and his deeds, people might have respected the film as a serious work and paid it respect. Playing Hercules as an uncool hick who is duped by everyone around him, regardless of the outcome, was the absolute worst tack to take. The fault, interestingly arose not from any purposeful intent, but because the film's producers had no clear plan in mind for the film. 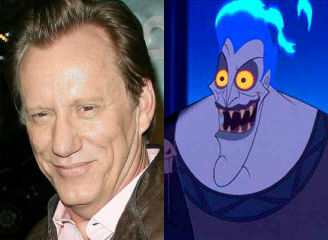 James Woods came in for a reading and played the character of Hades as a joke rather than as the ponderous, serious heavy in the script, and the producers meekly decided to go with that. Then, they let him create his own dialogue, which comes out ultra-smooth and not the least bit respectful of the material. It was a complete fiasco, and nobody ever really owned up to it. "Hercules" still did moderately good business based on the existing momentum of the Disney Renaissance, but the wheels were starting to come off of that revival because Disney, quite simply was over-stretched. A little more thought and oversight might have led somebody to step in and tell the directors that Hercules might seem ridiculous to them, but he sure doesn't to a lot of people around the world - people who buy movie tickets. With all those projects underway at once, and their best team on the job, who was going to minutely examine every decision made on such a sure thing as "Hercules"? Nobody, apparently. To show how far off track "Hercules" got, at one point they were considering Gregory Peck for the role of Zeus. The thought of him voicing a character in a film of juvenile nonsense is, well, unthinkable. And yet that's what "Hercules" became. Look! I have my own action figure! "Hercules" by no means is all bad. It is a fast-paced romp which takes gleeful fun in mocking everything in its path. If you are looking for a jokey take on the Greek legends, "Hercules" is a good place to start. James Woods is funny, and so are some of the supporting characters. Saying that he is as good as Robin Williams in "Aladdin" is a stretch, though, and that is the type of performance it would have taken to pull this off. 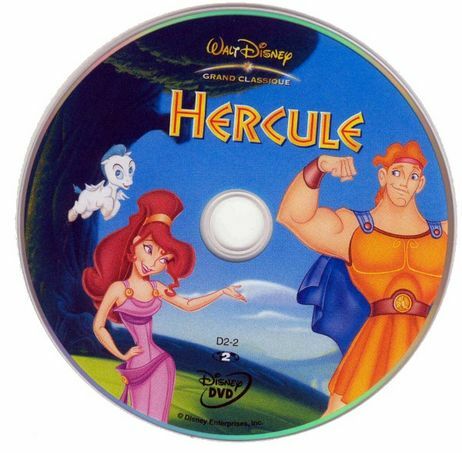 Disney has pretty much buried "Hercules" in the vault, with the last DVD release coming in 2000 and none currently scheduled. Pick "Hercules" up for a few quick laughs, but it really doesn't add much to what you can see about Hercules elsewhere.